The annual golf tournament is the United Way’s largest fundraising event of the year. For the past several years it has been held at the Oswego Country Club in July. This event gives us the opportunity to reach an audience beyond those who give through payroll deductions, and allows us to spread our mission of Ending Hunger, Building Successful Youth, and Ensuring Wellness with new individuals and businesses. The relaxed day of the golf tournament provides a chance for up to 250 donors, volunteers, and supporters to join together for a day of fun, while raising funds to support the more than 20 United Way partner agencies that are working to address the changing needs of our community. Partnerships are strengthened with team competition away from the workplace. 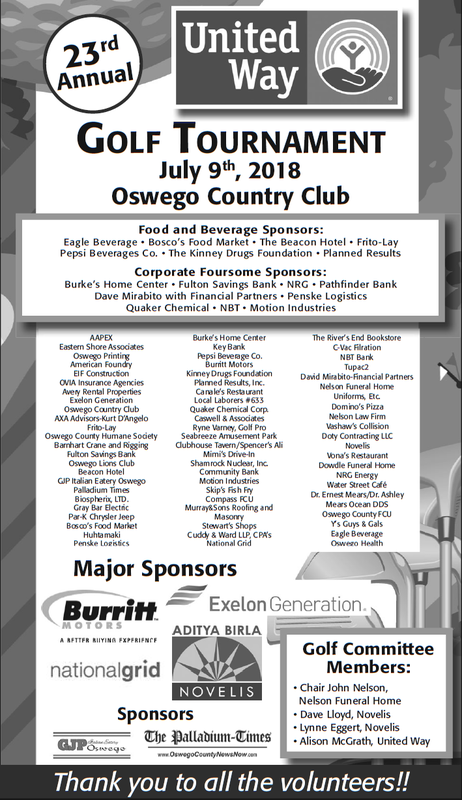 By sponsoring the golf tournament, businesses and their employees can network with a diverse sector of community leaders who share the same commitment of creating a brighter future for Oswego County. The golf tournament flights start at 8 a.m. and 2 p.m. and each round includes breakfast/ lunch or lunch/dinner, a brief program for each flight announcing prizes, special awards, and recognition of volunteers and company support. Strategic planning by the golf committee and over 40 volunteers makes the tournament one of the best run in CNY. We hope you can join us for this fun day on the course that helps to raise awareness about the pressing needs in our community! Thank you to our 2018 Sponsors. 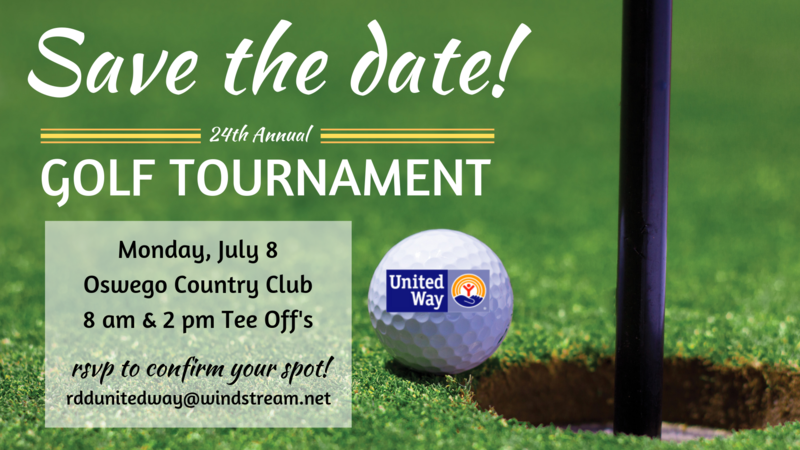 If you are interested in sponsoring the 2019 Golf Tournament, please contact the Resource Development Director at rddunitedway@windstream.net or 315-593-1900.